Type 2 diabetes is a condition that can without question be managed by the foods you eat. And there are many natural remedies for diabetes that can also be beneficial. The purpose of this article is to speak to the noise that you may have heard about one mineral in particular – Chromium. Let’s take a closer look at chromium for diabetes, and see if it’s a viable option for controlling blood sugar. Chromium’s effect on blood sugar levels was first discovered over half a century ago. Its effects were first discovered in lab rats, when researchers tested pre-diabetic rats with chromium and found that it significantly improved glucose tolerance. It was then that they named chromium, glucose tolerance factor or GTF. Since then, chromium has been widely studied for its effect on insulin and its ability to make it work better. One of the core defects of type 2 diabetes is insulin resistance. This generally means that they body doesn’t respond properly to insulin. In 12 of 15 controlled clinical studies, supplementing chromium was found to improve glucose uptake in people with impaired glucose tolerance (pre-diabetic). And when used with biotin it was found to improve beta-cell function and glucose uptake in the muscle and liver cells and reduce glucose output from the liver. In one study in China, patients with type 2 diabetes were put into two groups, one given 200 mcg per day, and the other 1,000 mcg per day. This resulted in statistically significant reductions in A1C, and insulin levels. In the group of patients taking 1,000 mcg per day, there was up to a 19% reduction in blood sugar levels. It was also found that women with gestational diabetes, benefitted from supplementing chromium picolinate. In studies, chromium supplementation was found to help reduce fasting blood sugar levels and insulin levels. 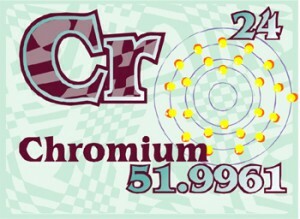 How Much & What Type Of Chromium Is Best? In studies, chromium polynicotinate was found to be better absorbed in the body than both chromium picolinate and chromium chloride. And the recommended dose of 200-400 mcg per day was found to provide the best results. If you’re looking to add chromium to your diet to control type 2 diabetes you need to get my master your diabetes program. In master your diabetes, you’ll learn why diets always fail and a formula for customized, tailor-made blood sugar control.